A tiny, ant-sized radio has been developed by engineers at Stanford University, which is small enough and cheap enough that it could be used for a wide variety of applications, specifically "Internet of Things". 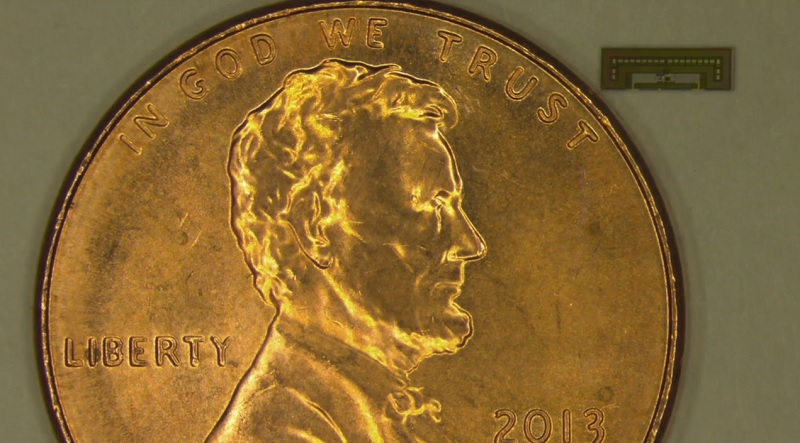 The radio itself, seen above next to a coin, is made from a piece of silicon just a few millimeters in size; one tenth of the size of a regular Wi-Fi antenna. Despite its small size, the engineers at Stanford managed to cram in a receiving antenna, transmitting antenna and a small microprocessor. All the energy required to power the chip is harvested from background electromagnetic fields, so there's no need for a battery or other power source. That said, if a single AAA battery were connected to provide power, the chip would be able to function for more than 100 years. The reason for creating such a small radio - which costs just a few cents to produce - is to facilitate more interconnected devices through the Internet of Things. Although the chips operate in 24 to 60 GHz frequencies, which are very short range (a tenth of a meter or so), they could be deployed as essentially more powerful RFID tags. One such use could be for lighting. Place the tiny radio inside your ceiling lights, set up a wireless ambient light sensor nearby (on a window ledge, for example), and the radio could be used to gather data from the sensor that tells it when to turn on and off. This could be achieved for a tiny cost with virtually no power usage, which definitely sounds promising for the future.